Uganda is known for being one of the greenest countries in Africa. Not for her the dry yellow grasses of the Serengeti, the orange dunes of Namibia’s Skeleton Coast, or the cracked heat of the Sahara desert. 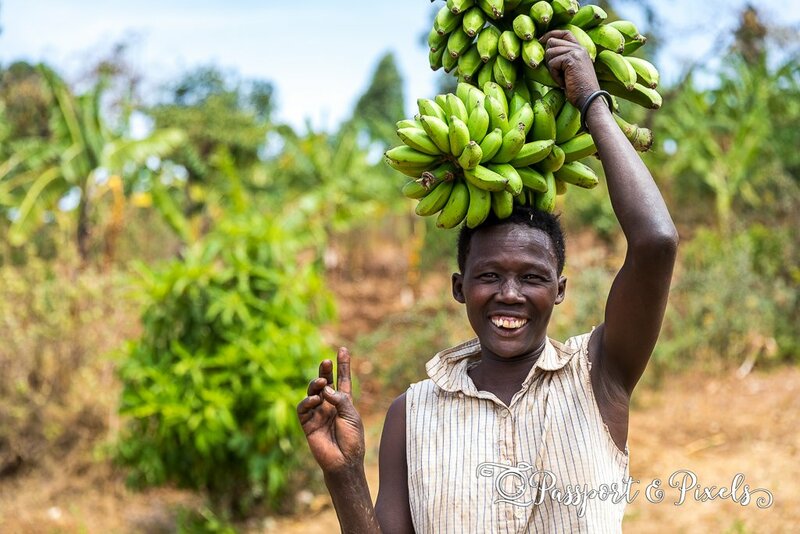 Uganda is lush and tropical, fed by the waters of Lake Victoria, washed by the frothing rapids of the River Nile, and doused by plentiful (and often infuriating) rain that may stop traffic but also gives life to rolling green hills and farms and plantations up and down the country. 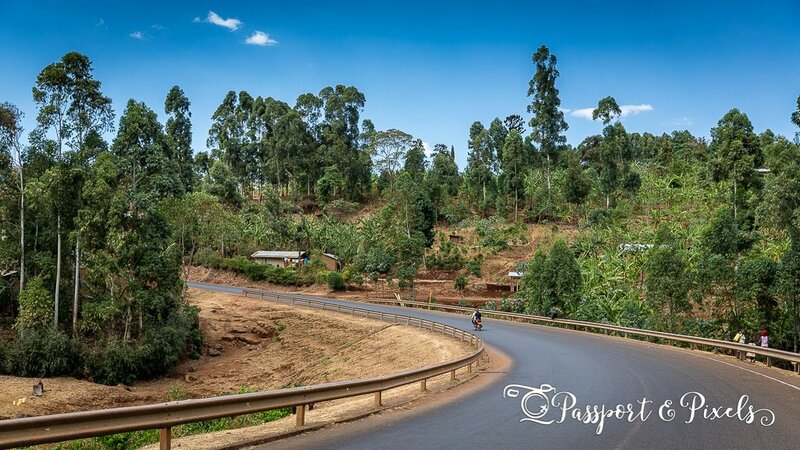 And while Kampala can sometimes feel hot, dry and dirty, you don’t have to travel very far to escape the noise and bustle of the city and embrace the tranquillity of some of the country’s most inviting landscapes. 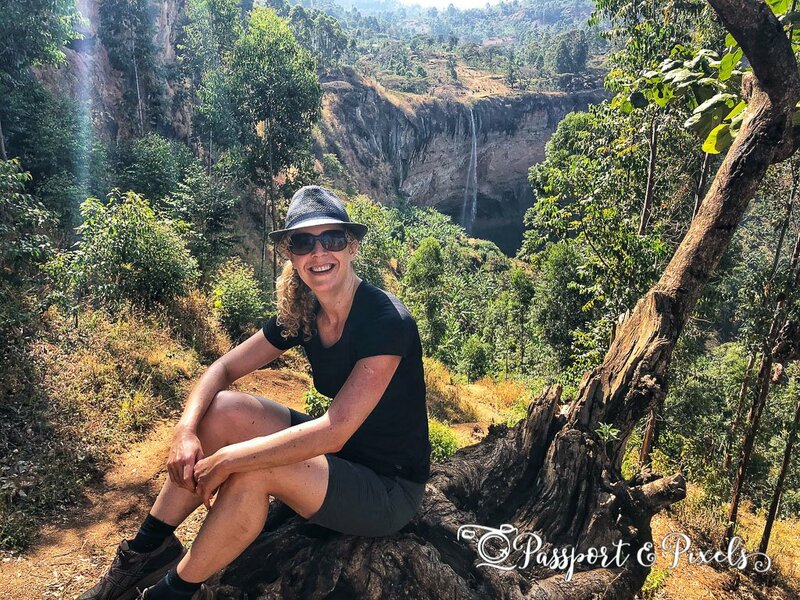 So when I was invited to join a group for a weekend away in Sipi Falls, about 275 km from the capital, I jumped at the chance to see a little more of the country and inhale some fresh air in one of Uganda’s most popular hillside retreats. 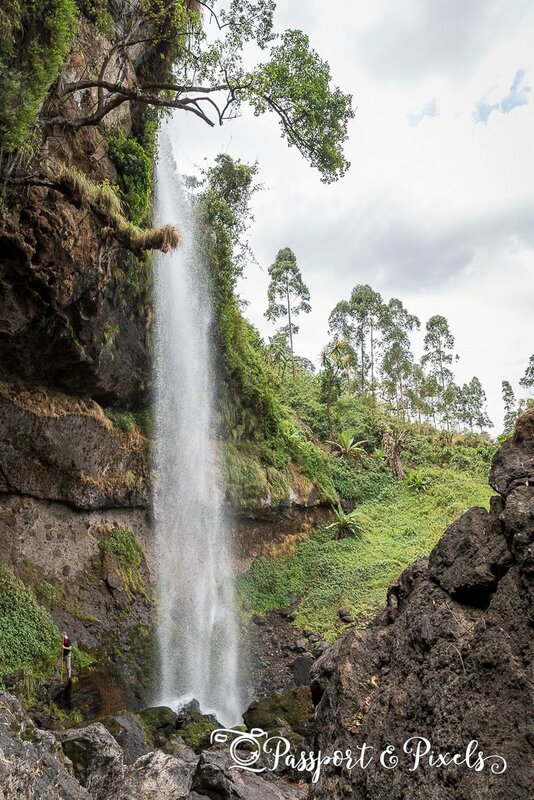 Sipi Falls is an area in Eastern Uganda on the edge of Mount Elgon National Park, close to the border with Kenya. 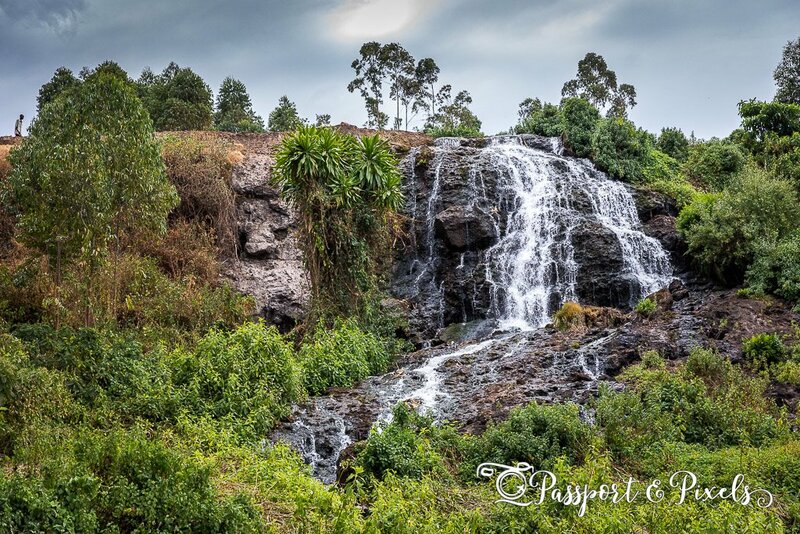 It gets its name from the nearest small trading centre, Sipi, and from a series of three pretty waterfalls on the Sipi River that are the area’s main tourist attraction. 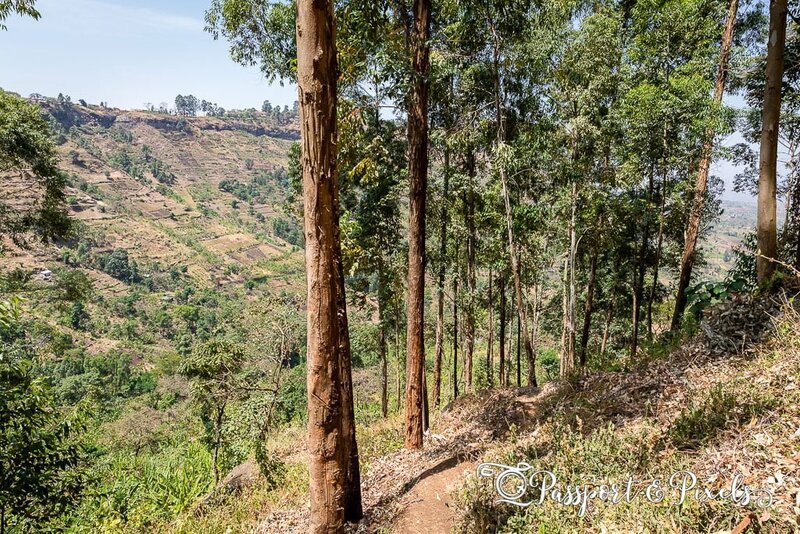 Situated at 1,775 m above sea level in the foothills of Mount Elgon, it’s a cool hillstation popular with hikers and climbers, as well as with Kampala residents like me who simply come to enjoy a welcome escape from the sweaty heat of the city. It takes about six hours by road to get to Sipi Falls, so we decided to take the Friday off work and make a long weekend of it. As there were seven of us in the group, we split the cost of a car and driver, though it’s also possible to get there by public bus (this will obviously take longer and probably not be nearly so comfortable but will save you a sizeable chunk of cash). We left at the entirely unsociable hour of 6 am, which felt pretty traumatic at the time, but the pain was eased by a quick stop at a branch of Cafe Javas and an utterly heavenly almond croissant still hot from the oven (I’m not kidding, it’s worth dragging yourself out of bed that early just to go and get one that fresh). 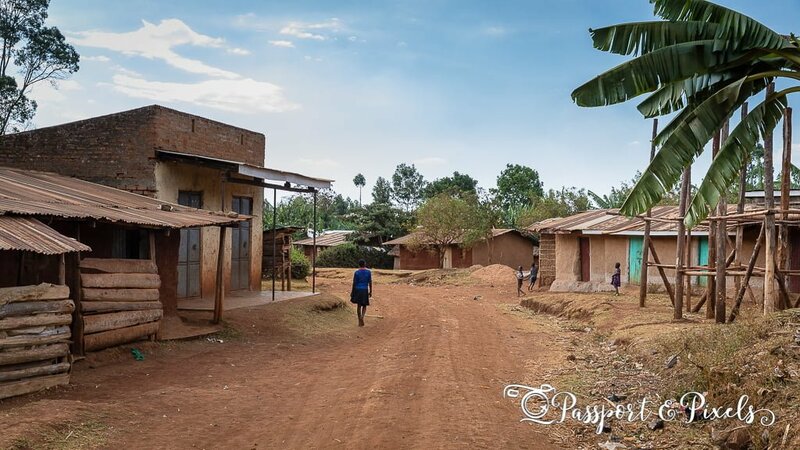 It also helped to know that we had six hours to snooze in the car, and that leaving that early would give us a full afternoon enjoying the fresh air and scenery in Sipi. 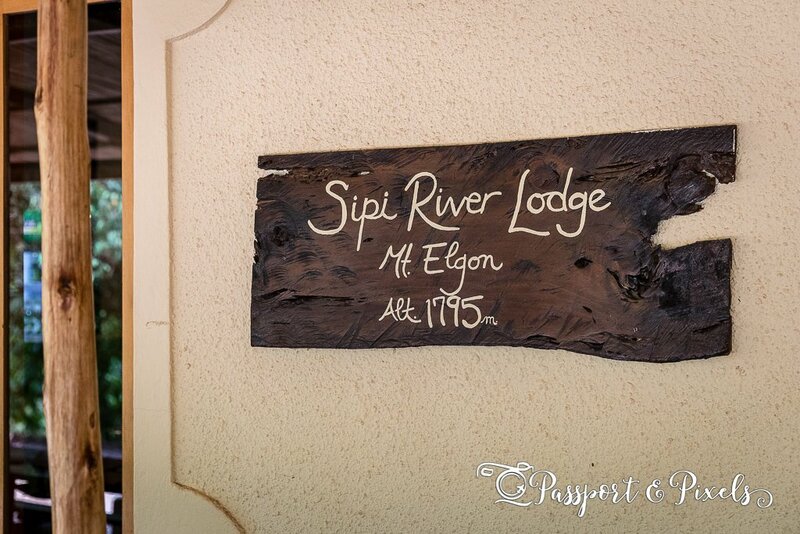 With stops for lunch in Jinja and at random petrol stations for bathroom breaks and to pick up snacks and water, we made good progress and arrived in time for lunch at our hotel, the Sipi River Lodge. 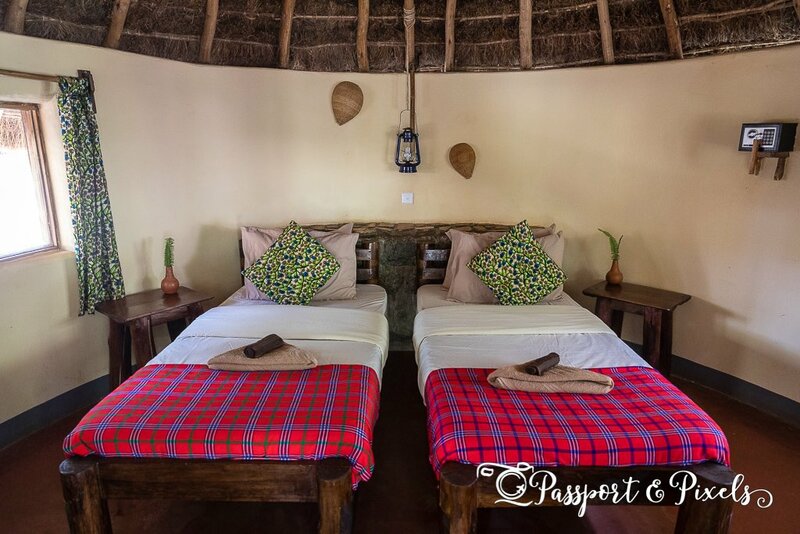 As you would expect in in a place popular with tourists, there’s no shortage of accommodation in Sipi Falls, ranging from backpackers’ joints with camping or basic rooms, right up to some rather more luxurious (and more expensive) lodges. 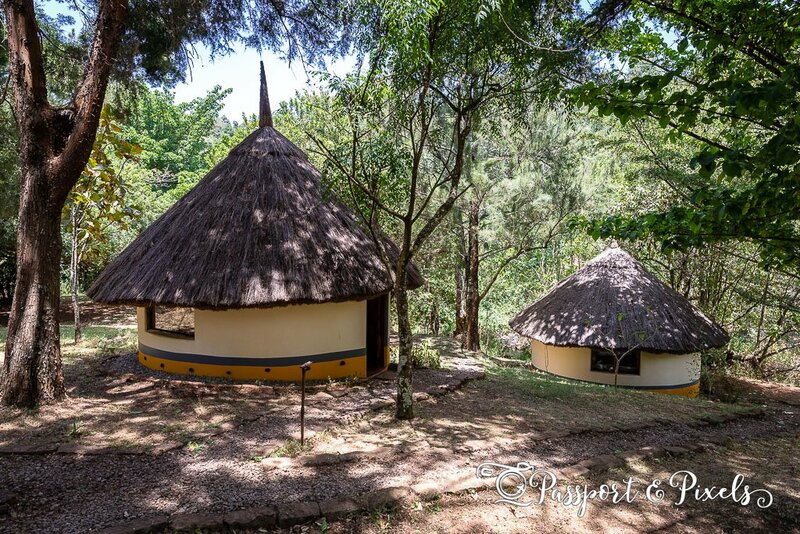 Sipi River Lodge definitely falls into the latter category, but for style and charm in an idyllic setting, close to the waterfalls, I reckon it would be hard to beat. 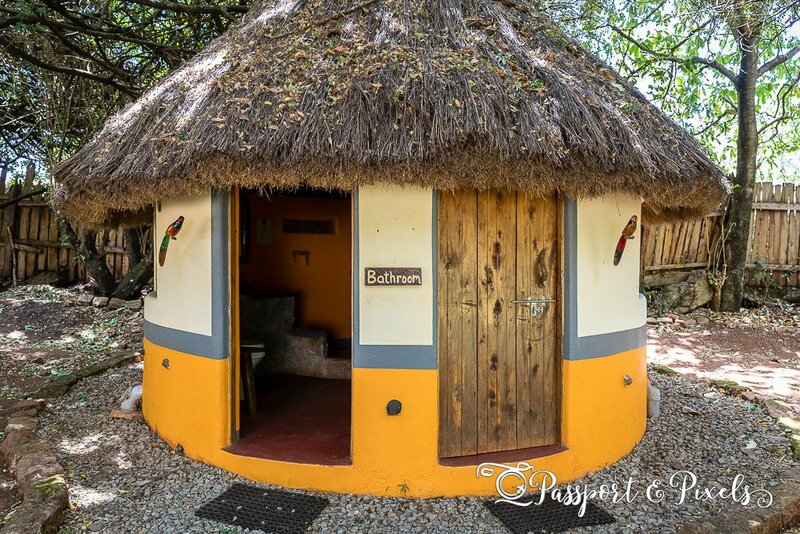 The lodge has a range of elegant rooms and cottages, but we opted for the bandas, cute little huts with a shared bathroom which meant we got to enjoy the charm of the lodge and save a bit of cash at the same time. The bandas were fairly basic but clean and comfortable, with stylish touches that showed a great deal of thought had been put in to the design. Even the bathroom, though shared and a short walk across the yard (annoying when you need to pee in the night!) made up for its location by being pretty cute. 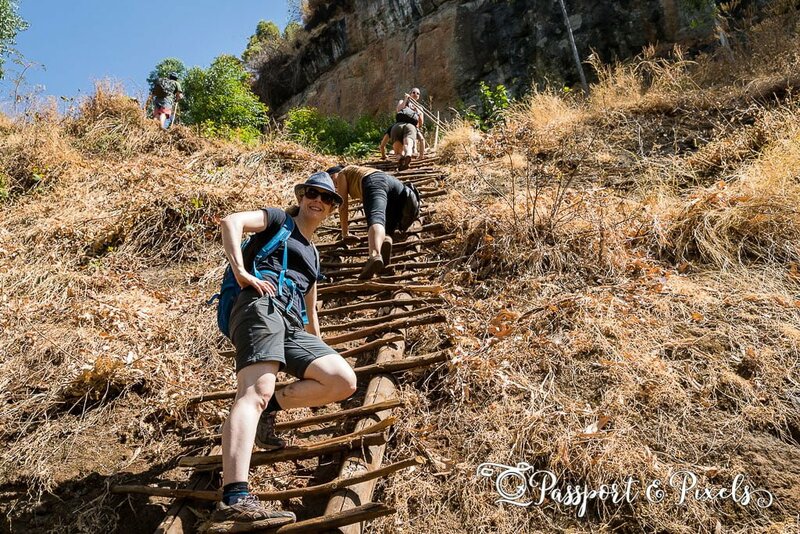 There are plenty of things to do in Sipi Falls, from various hiking routes, to birdwatching trips, climbing, abseiling, and cultural visits into the nearby villages, most of which can either be arranged with a private guide, or directly through your accommodation. 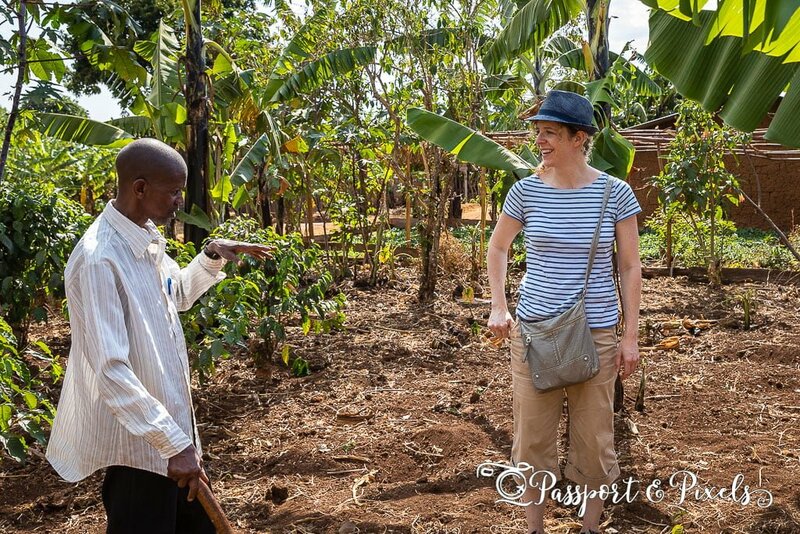 But since the Sipi Falls area is particularly well-known for its Arabica coffee plantations, we decided to do a coffee tour, as a way of stretching our legs after the journey and getting a first proper look at the scenery. 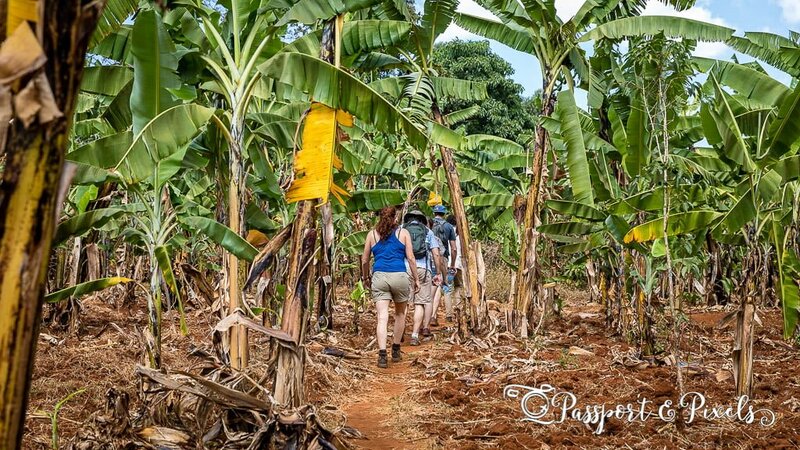 We met our guide at the hotel before beginning a short hike up the hillside, through leafy banana plantations which serve two functions: firstly to supply bananas (obviously!) and secondly to provide shade for the coffee trees which grow beneath them. At the top the hill we entered a small village, where were shown to the house of the coffee farmer, Mike. Mike has lived in the village all his life and makes a living growing and selling coffee in the local area (though I suspect these days he makes more money from giving tours than from actually selling his coffee). We also met Mike’s daughter, Leah. Leah was sitting on the ground outside the house doing her homework, so I interrupted her for a quick chat. She told me she’s 15 and would like to be a lawyer when she grows up. The homework Leah was doing was computer studies: she was copying notes about computer programmes and websites. Since the notes were all written on paper it did make me wonder whether she actually has access to a real computer – but I suspect the answer is no, and for now she will have to be content with just learning the theory. Mike took us out into his plantation and showed us how the coffee plants are planted and grown. 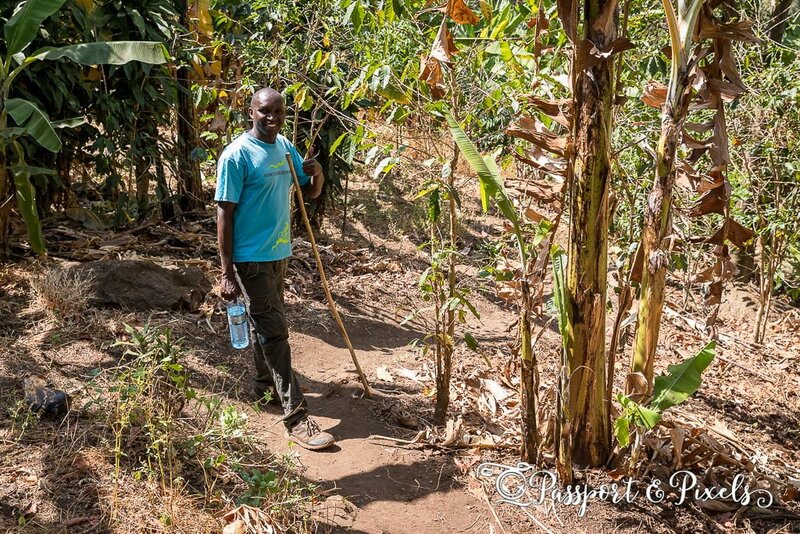 He explained that the Sipi Falls area is great for growing coffee because its high altitude relative to the rest of the country means it’s cooler, and it also gets plenty of rainfall. 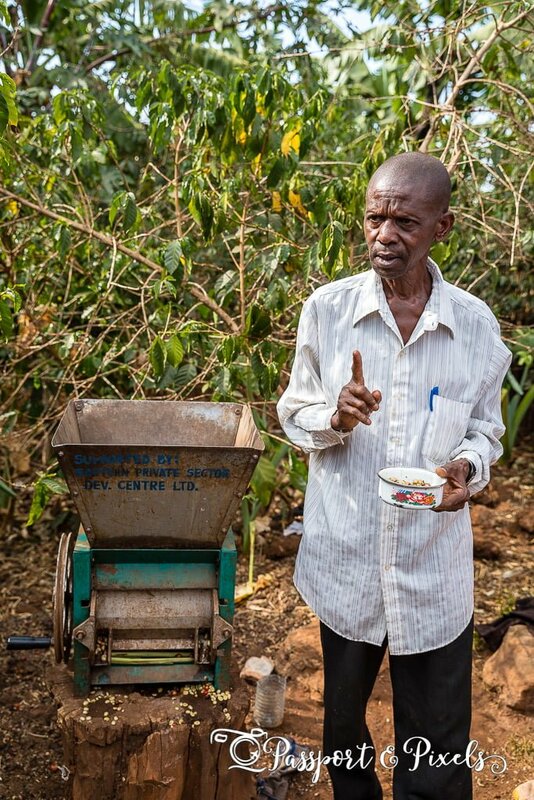 We got to try our hand at planting a seedling, and also at crushing the coffee berries to get the beans out using the hand-rolling machine below. 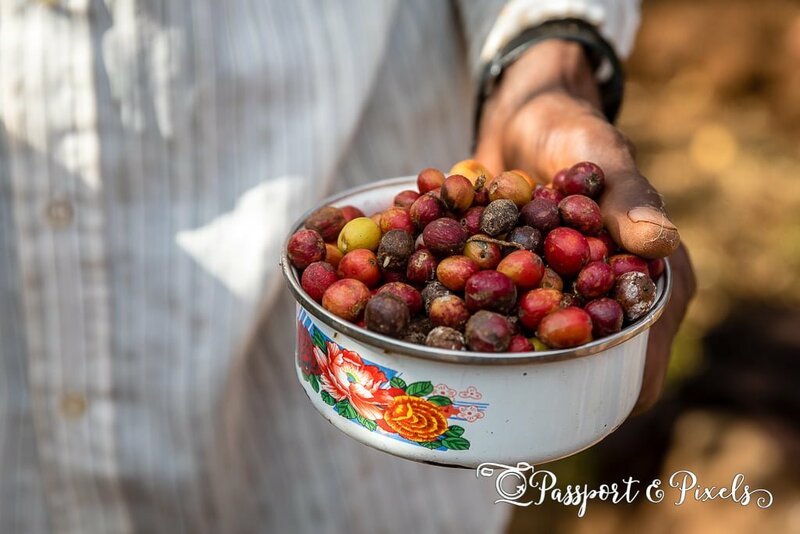 I’m not actually a coffee drinker, so I wasn’t all that fussed about learning the intricate details of how coffee is produced – but I did very much enjoy the exercise, the sunshine, the scenery and the fresh air after weeks in the city. 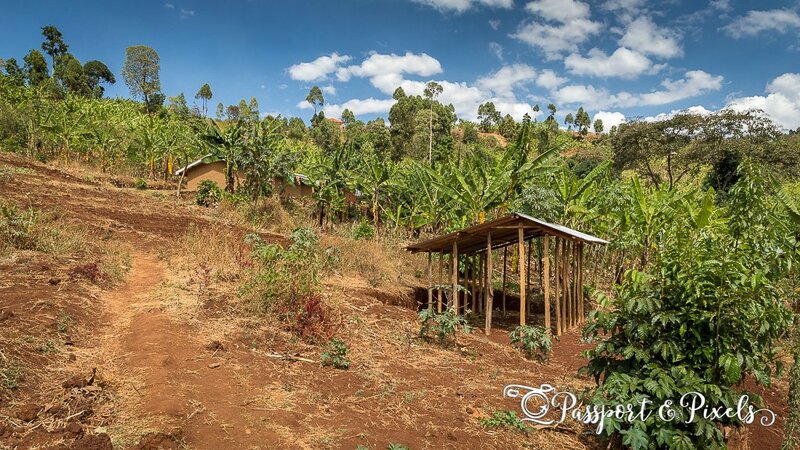 After learning everything there is to know about growing coffee, we headed back down through the village. At first we thought it was deserted, but then we realised why: everyone was at a meeting of the local savings and credit co-operative. 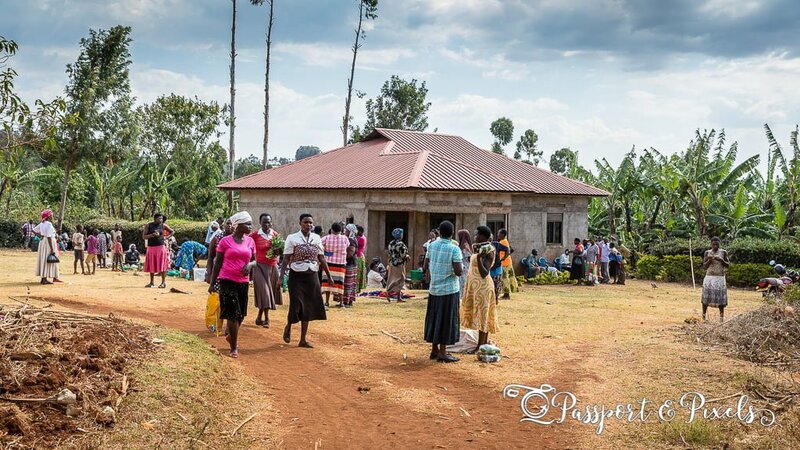 People living out in the remote villages don’t have access to banks, so they have their own systems. The details can vary, but in this particular village all the members of the co-operative pay in a small amount every month, and then once a pot has been built up, one member gets to take the whole lot and use the capital for whatever they need. Each person will get their turn eventually, and a name is drawn at random to decide who wins next. The system allows individuals to get access to a large chunk of capital to invest in a business or for an expensive outlay that they would otherwise never be able to afford. I tried asking if I could take photos of some of the members but, usually for Uganda, everyone was extremely camera shy. Even the children, who as usual merrily chased after us shouting ‘Muzungu! Muzungu!’ (white person), scattered like startled rabbits as soon as I tried to lift my camera to my eye. 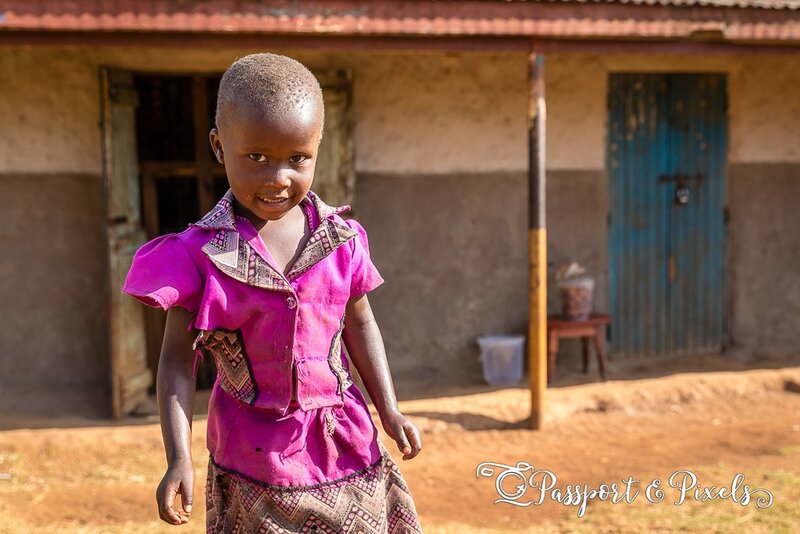 I managed to find only one little girl who was happy to have her photo taken, and even then she looks a little nervous! 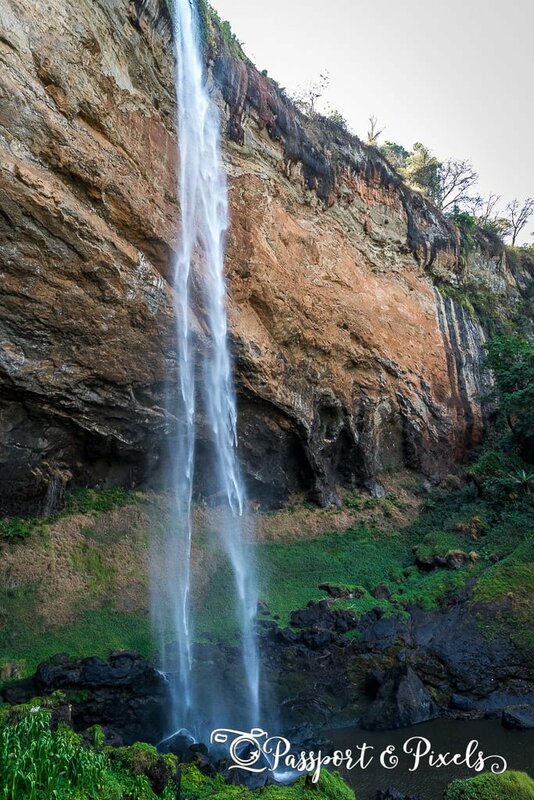 One of the most popular things to do in Sipi Falls is the 7 km hike to see the Sipi Falls themselves. 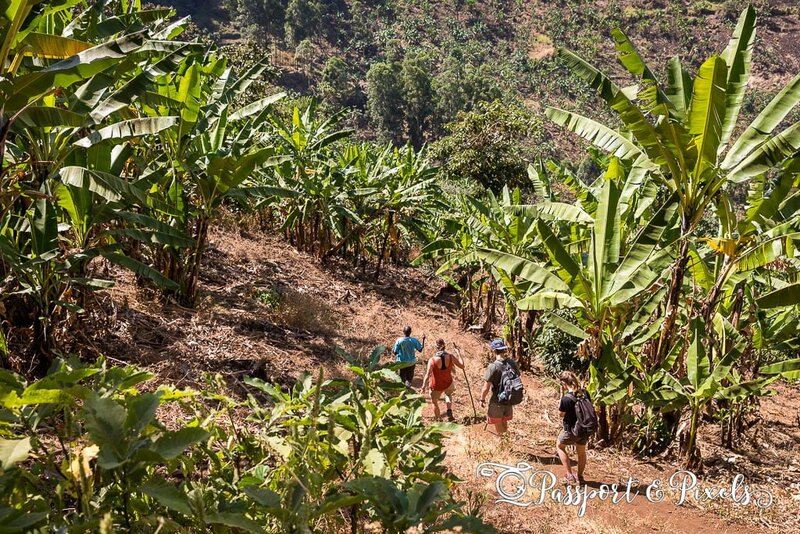 As before, the walk started with a short uphill climb through banana plantations and groves of pine trees before we reached the top and were rewarded with a spectacular view of the entire district. Then it was round another corner for our first distant view of the main falls, tumbling an impressing 100m over the cliff in the distance, though looking rather skinnier than usual thanks to a recent lack of rainfall. But how to actually get to the waterfall itself? 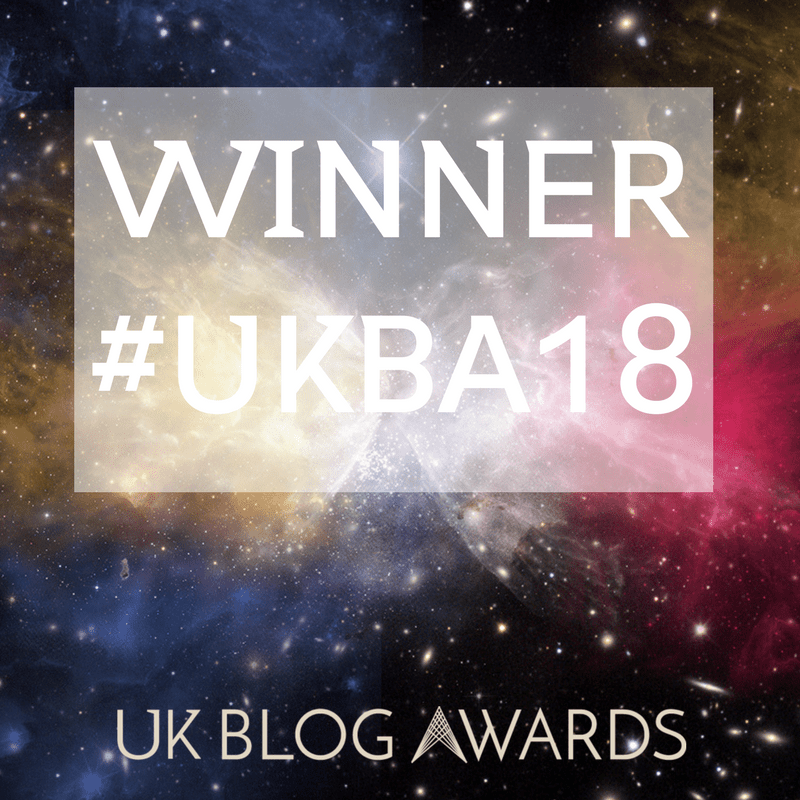 The only way was down, and turned out to involve a slightly hairy and steep descent using a combination of slip-sliding, holding onto trees for support, and one fragile-looking but surprisingly sturdy home-made ladder. Fortunately it was dry, as I’m not sure how keen I’d be to attempt this walk after heavy rainfall. It was slow and hot progress in the full heat of late morning, but we made it to the bottom eventually, and were finally able to cool off in the shade of the cliffs and the spray from the waterfall. We’d brought swimming things with us, and we briefly considered stripping off and jumping in, but it looked cold and slightly like too much hassle so in the end we decided a quick semi-shower in the spray was enough. After pausing for photographs it was time to move on – unfortunately back up the cliff the way we had come. That meant a steep uphill (great for burning off breakfast) and another go on that exciting ladder. Back at the top, we met a couple of lads who had something exciting to show us. 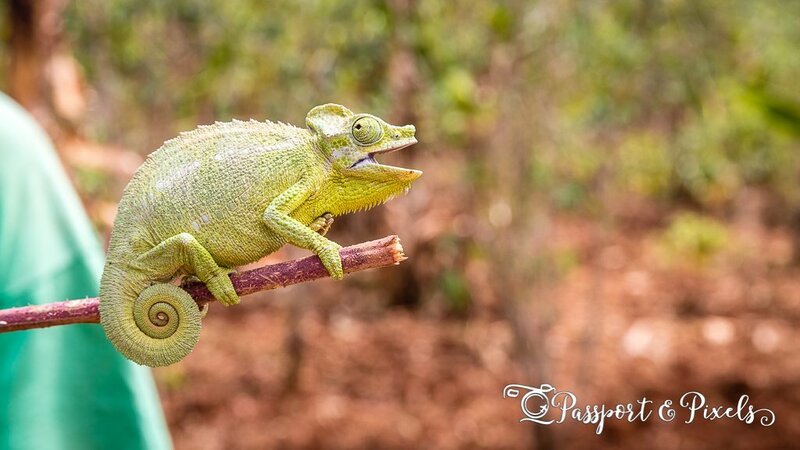 It turns out there are chameleons living wild in this area, and they had found one for us to take a closer look at. I’m not sure if this is a scared, angry, or happy face (I’m hoping it was the latter) but I do think the idea of having wild chameleons living in your backyard is pretty awesome. We also met Oliva, 26, on her way to market. Oliva is selling matoke, a kind of green banana similar to plantain but much smaller. It must be cooked before you can eat it, and is usually boiled, mashed, or made into crisps. 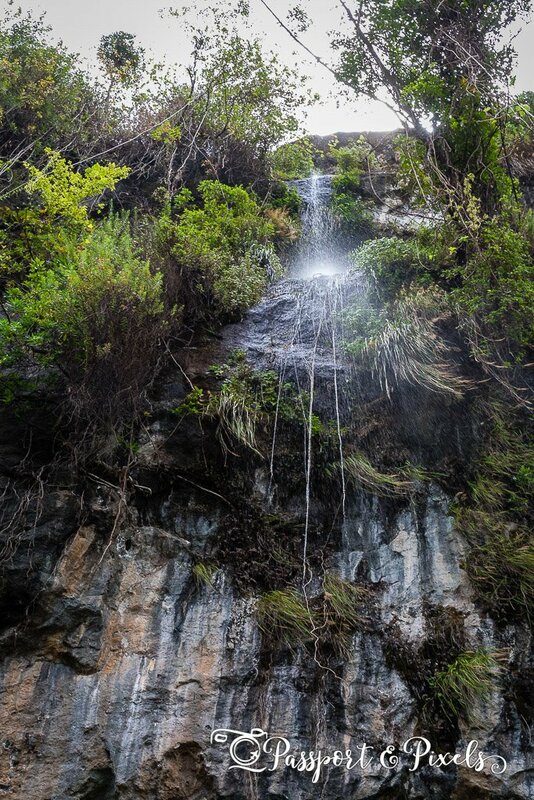 We crossed back over the main road and descended down a slightly muddy and damp track to the second falls. As we approached we could hear the whooping and squealing of a large group who were clearly enjoying themselves in the chilly water but rather perforating the peace and quiet. Another short but steep climb took us up to the top falls, the smallest of the set, and even smaller again due to the fact that it was the end of the dry season. From there it was just a short scramble to the very top of the falls, and along the river that feeds them. 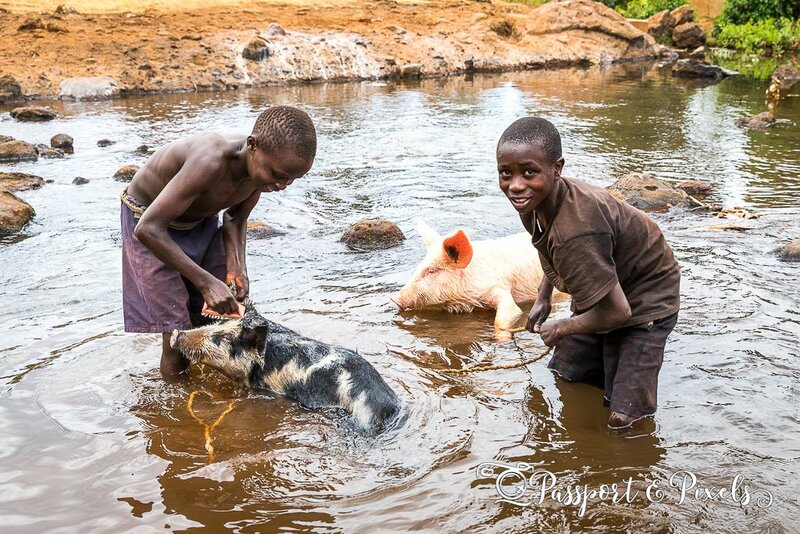 There we found several dozen locals going about their daily lives, washing clothes, bathing, and even giving the pigs a good scrub. 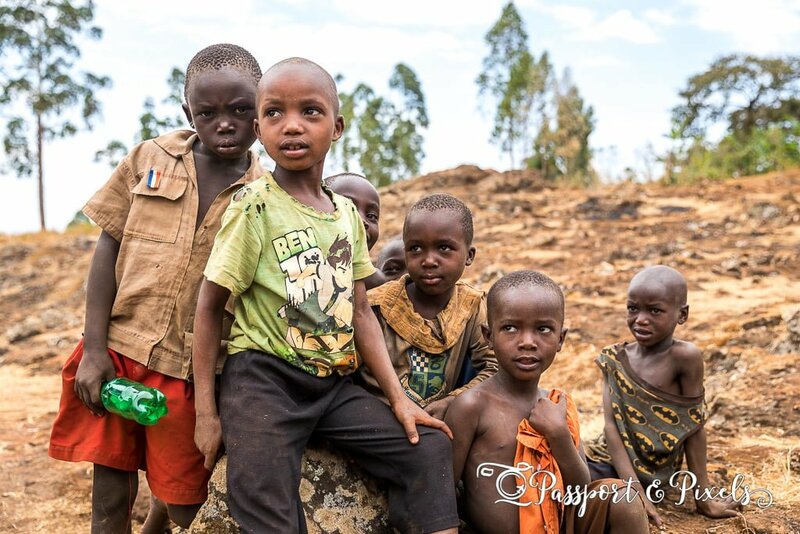 Unlike in the village, here the local children were only too happy to chat and pose for photographs. As usual they asked for sweets or money in return, but we didn’t have any sweets and had been advised not to give them cash, so they had to settle for smiles and handshakes. The walk in total look around four hours, including plenty of time to stop for photographs. While steep in places, and pretty sweaty in the hot sunshine, it wasn’t too arduous at all, and well worth doing if you enjoy fresh air, exercise, and pretty scenery. Sipi Falls is about 6 hours’ drive from Kampala. If you can afford to, hire a car and driver, otherwise you’ll need to get a bus. There are several buses a day from Kampala to Mbale (about a 5-6 hour journey depending on which service you get) and then you’ll need to get a matatu (local minibus) from Mbale to Sipi Falls (about an hour). There are plenty of places to stay in the area. 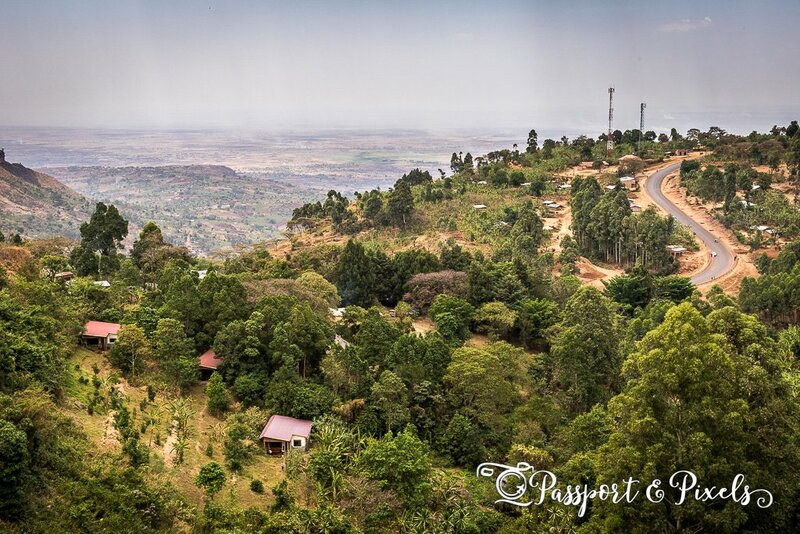 If your budget is generous then try Sipi River Lodge, or Sipi Falls Resort, however if it’s a bit smaller then Noah’s Ark Resort is just across the road and has an amazing west-facing deck where you can watch the sun set over the plains below. 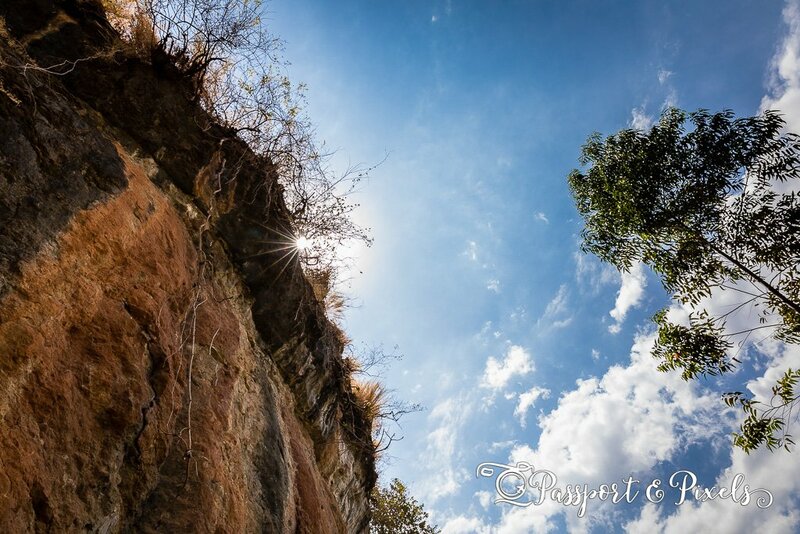 If you’re ready to book, click here to see a selection of other hotels in Sipi Falls. If you want to hike to the falls, take a local guide. You’ll be passing through private farms and the guide will know the way, and some of the money you spend goes to support the community. Always ask before taking photos of people as many of the locals here don’t like it. 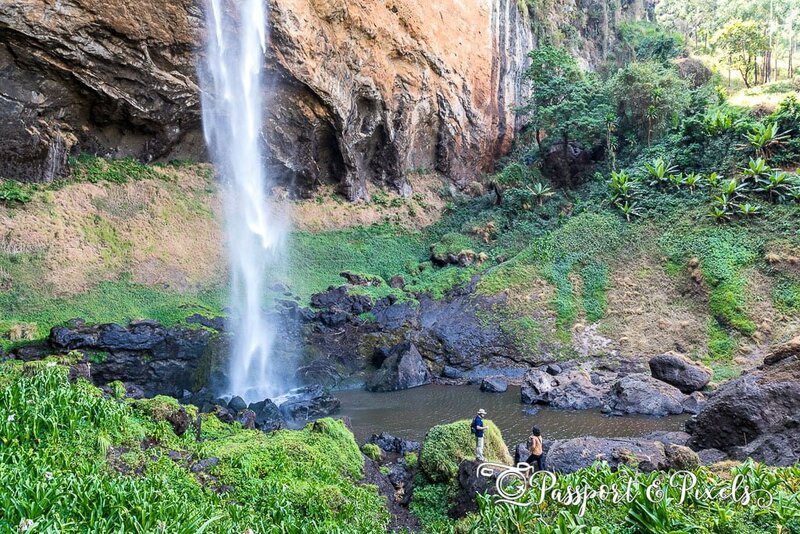 Have you been to Sipi Falls? What did you think? Are there other places in Uganda you thought were better for fresh air and scenery? 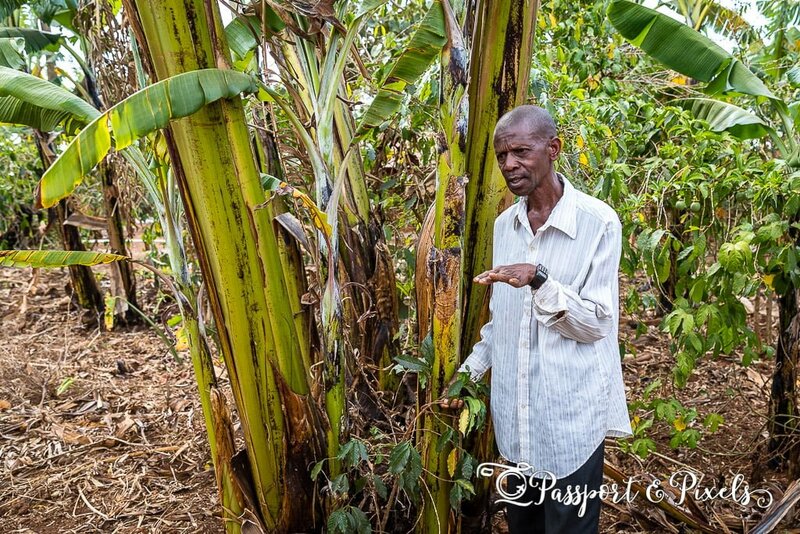 Comment below… and check out some of my other Uganda posts while you’re here!